The Art Museum continues the successful teaching gallery model in in the Guthrie Special Exhibitions Teaching Gallery. 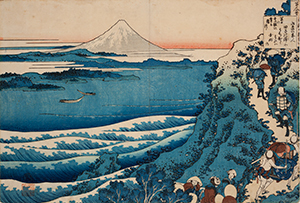 This semester the gallery features selections of Japanese ukiyo-e prints, Central American masks and artifacts, and artworks that range from American Regionalism to Abstract Expressionism. The works of art have been selected with faculty from History, Anthropology, Art History, and the Honors Program for specific courses. The artworks are available to students throughout the semester for use during the museum’s public hours. The installation is divided into four sections, one exhibition per wall for each class. While the gallery is designed to meet the needs of the academic community, it is also open to the public in order to demonstrate connections between the Art Museum and teaching across the curriculum, supporting UW’s academic mission.